How do God’s servants handle unforeseen questions? – Open Our Eyes, Lord! How do God’s servants handle unforeseen questions? As a pastor I was rolling right off the factory floor: I had just mailed my doctoral thesis back to Scotland and was waiting for the oral exam. So I was primed and filled with data about Pauline eschatology. I’m ready, folks, ask me anything! The first question I fielded was not about Greek, theology, church history, anything that I had ever read about. For you non-Americans, Ford trucks versus Chevrolet is one of our long-lived debates (think of “Apple or Microsoft?”). It runs deeper than politics. Google it if you don’t believe me. I was opinion-free on the Ford/Chevy debate; I had no dog in that fight. And I didn’t want to spend my first Sunday afternoon of my ministry, alienating someone because I chose the wrong darn pickup. However the thought occurred to me (Is that you, Spirit of God?) that I needed to respond differently than I normally would. Not deceitfully, but along a different tack. 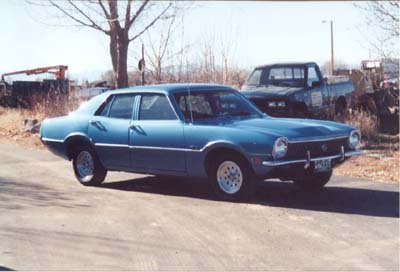 So: I had once owned a Ford, a 1971 Maverick. A real dog, too; many of the miles I put on it were driving to the mechanic and back. But definitely a Ford. The Spirit works quickly. Within a second or two after hearing the question, I snorted and said, “FORD!! Of course!” (In New England, one pronounces Ford and course deeply in the throat, and I said them with the proper intonation). You see, the only really wrong answer I could have given was indifference: I don’t care. I don’t know. They’re both okay. Does it really matter? Why are we bothering about this while all the starving children, etc.? I don’t even remember if he thought Ford was better than Chevy. But he did think it mattered, and he was pleased that I understood that. Jesus didn’t tell people their questions were frivolous. He answered them, but he then turned the discussion around to deeper things. John 4 is a fine example, with the Samaritan woman’s implied question: “So, Jesus – Samaritan Temple or Jerusalem?” “Jerusalem, of course,” said Jesus, because it was true to a point, and because it really mattered to her. But his interest in the question was limited. It was already too late in history to be debating such matters – the Father was really interested in people worshiping him in the Spirit and in truth, that is, each believer is a temple (John 4:21-24). When people ask us questions, they might be looking for information, or an opinion. Or they might just be wanting to hear that they matter, both to us and to God. And we who follow the way of love will understand that and act accordingly.